First, we’re adding APIs to support positional controller tracking with six degrees of freedom—or 6DoF—to the Mirage Solo. With 6DoF tracking, you can move your hands more naturally in VR, just like you would in the physical world. To date, this type of experience has been limited to expensive PC-based VR with external tracking. We’ve also created experimental 6DoF controllers that use a unique optical tracking system to help developers start building with 6DoF features on the Mirage Solo. Instead of using expensive external cameras and sensors that have to be carefully calibrated, our system uses machine learning and off-the-shelf parts to accurately estimate the 3D position and orientation of the controllers. We’re excited about this approach because it can reduce the need for expensive hardware and make 6DoF experiences more accessible to more people. We’ve already put these experimental controllers in the hands of a few developers and we’re excited for more developers to start testing them soon. We’re also introducing what we call see-through mode, which gives you the ability to see what’s right in front of you in the physical world while you’re wearing your VR headset. See-through mode takes advantage of our WorldSense technology, which was built to provide accurate, low latency tracking. And, because the tracking cameras on the Mirage Solo are positioned at approximately eye-distance apart, you also get precise depth perception. The result is a see-through mode good enough to let you play ping pong with your headset on. Playing ping pong with see-through mode on the Mirage Solo. The combination of see-through mode and the Mirage Solo’s tracking technology also opens up the door for developers to blend the digital and physical worlds in new ways by building Augmented Reality (AR) prototypes. Imagine, for example, an interior designer being able to plan a new layout for a room by adding virtual chairs, tables and decorations on top of the actual space. Experimental app using objects from Poly, see-through mode and 6DoF Controllers to design a space in our office. Finally, we’re introducing the capability to open any smartphone Android app on your Daydream device, so you can use your favorite games, tools and more in VR. For example, you can play the popular indie game Mini Metro on a virtual big screen, so you have more space to view and plan your own intricate public transit system. Playing Mini Metro on a virtual big screen in VR. 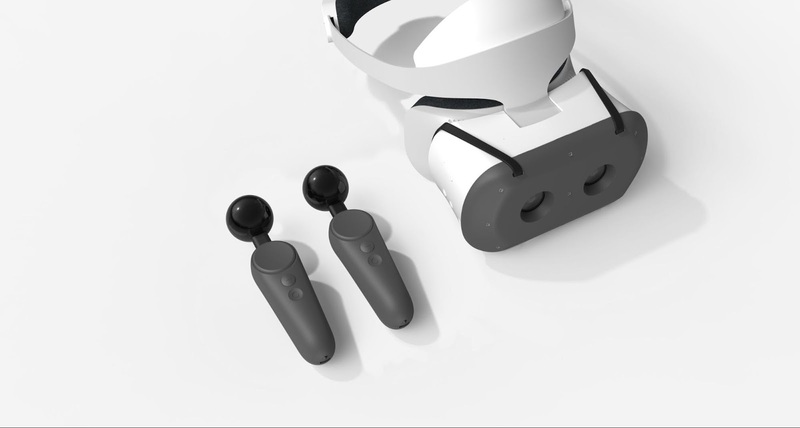 With support for Android Apps in VR, developers will be able to add Daydream VR support to their existing 2D applications without having to start from scratch. The Chrome team re-used the existing 2D interfaces for Chrome Browser Sync, settings and more to provide a feature-rich browsing experience in Daydream. The Chrome app on Daydream uses the 2D settings within VR. We’ve really loved building with these tools and can’t wait to see what you do with them. See-through mode and Android Apps in VR will be available for all developers to try soon. If you’re a developer in the U.S., click here to learn more and apply now for an experimental 6DoF controller developer kit.